It has come to my attention over the years that there are many interested in making their own nutrients so I have provided a few recipes. If you are reading the Acrobat version, you will find a nutrient calculator spreadsheet included with your download. Otherwise, please consult the table on the next page which details the salts required to make three hydroponic nutrient solutions for use with vegetative, fruiting and flowering crops. The weights shown in the following tables are based on making 1 gallon of stock nutrient solution. 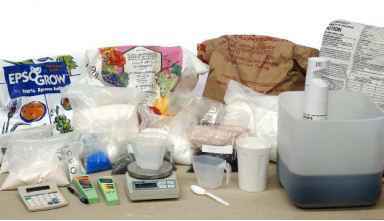 To make more than a gallon, multiply the gram weights by the total gallons of stock nutrient solution you require, for example, 2, 5, and so forth. These formulas have all been tested with a wide variety of plants in the same system, and have performed quite well. However, your results will depend upon the quality of raw materials and the precision with which you combine them. To mix your nutrient solution, fill an empty container with clean, warm water. Multiply the listed gram weights of each specific salt by however many gallons your container holds and dissolve each salt one at a time before adding the next. Once all salts are dissolved, allow the solution to cool before diluting it for production use in your reservoir. You will need an EC or TDS/PPM meter to determine how much of these stock solutions you will need to dilute into each gallon of water in your reservoir.. Refer to the labels on each of the elemental salts you purchase to familiarize yourself with safe handling practices. Store raw salts in a cool, dry place to keep them from absorbing moisture from the air which will offset their actual weights. Avoid using inaccurate "kitchen" type scales to weigh salts - accuracy, especially when making small batches, is critical. 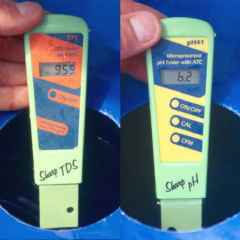 Meter on left shows a reading of 959 Parts Per Million, always take into consideration the starting concentration of your water and subtract that from your final reading to get the actual concentration of nutrients in solution. In this case, our water is 59 PPM before adding nutrients so our actual concentration is 900 PPM. The meter on the right shows a pH of 6.2. It is best to adjust the pH of your water after adding nutrients and waiting a period of one to two hours for them to mix thoroughly. How to make own nutrients? How to make your own hydroponic nutrients? How to get 7% Fe Chelated Trace Elements? How to make you own nutrients for hydroponic marijuana? 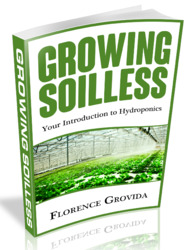 How to make formula nutrients hidroponics? 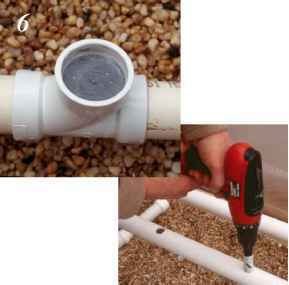 Do it yourself making your own hydroponics forulae?